Rosslyn Park’s Charlie Amesbury is hoping his side can continue improving as they look to maintain their promotion challenge in National One. The full-back/winger believes despite Park’s loss to title rivals Old Elthamians last weekend, Kieran Power’s men don’t need to reinvent the wheel. Prior to their defeat against OEs, Park had won six games in a row which saw them move to the summit of National One and even though they suffered a setback in Round 18, the men from the Rock sit just one point off the top. Park face Darlington Mowden Park this Saturday before ending January with a fixture against current league leaders Blackheath. Three cracking @elthamians tries in a thrilling 28-22 victory over Rosslyn Park at College Meadow on Saturday. “It was a disappointing result for us,” said Amesbury. “We’ve come on so much in the last month and the fact we were topping the table just after Christmas was really pleasing. “It meant we went into that game [with OEs] with some confidence. In the first half, we just didn’t perform, but in the second half, we showed our class and highlighted how much we have improved. “Obviously, we’re going to treat this game against Darlington Mowden like any other game. We know DMP have got a cracking squad and they have just started to hit some hot form so we know it is going to be super tough. Amesbury originally joined Rosslyn Park in December 2017 and his aim was to complete the rest of the season with the National One side. However, in the summer, he extended his stay at the Rock for another campaign and the 32-year-old is still enjoying his time on the field. “I finished living in Cambridge just over 12 months ago. 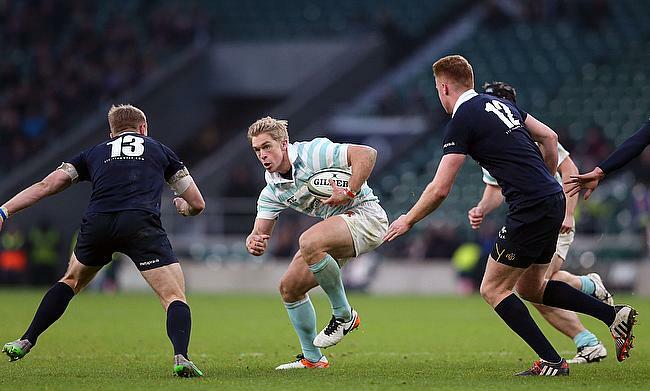 I just played the Varsity and it was an incredible high, but I realised I still enjoyed playing rugby,” said Amesbury. “Whilst the legs are winning and I am still fit, if I can carry on, then I will! I knew Rosslyn Park had a great bunch of boys there and I was actually moving in just down the road so all the right things aligned! With a rugby career which also includes playing in the Premiership and representing England 7s, Amesbury is one of the most experienced players in the division and he paid tribute to the National Leagues. “For me coming into the club, it took a bit of adjustment,” said the former Bristol, Sale Sharks and Newcastle Falcons man. “This is semi-pro rugby and in that first season last year, I struggled a bit with working alongside playing, but now it has settled for me. “I did actually start out on loan at Esher. I really appreciated the time I spent there. I cut my teeth in National League rugby because I was playing week in, week out. It is something academy players don’t get. “You get to put on a shirt, you get to build a bit of pride and you get to play in a game where if you lose, you’re dropping down the table and if you win, you’re moving up. Amesbury and his fellow Park teammates will be now focused on ending a tricky January on a high. They entertain Darlington this weekend and the visitors will arrive in the capital with some renewed confidence behind them. After a disjointed first half of the campaign, Danny Brown’s men kicked off the New Year with a brilliant win over OEs before narrowly losing to Blackheath last time out. Amesbury is fully aware of the challenge that awaits his side on the weekend, but because the National One table is so tight this term, he believes every game between now and the end of the season will be tough as Park aim to stay in the promotion hunt. He added: “As a squad, we are not looking too far ahead. We have picked up a loss which means there is a bit more onus on us to make sure we put things right against DMP because there is no stepping back. “To be honest, every game this year has been a huge challenge. We went away to Bishop’s Stortford just before Christmas. We were getting hammered at half-time and we managed to nick the win at the end because Stortford put in a great performance and they are at the other side of the league.